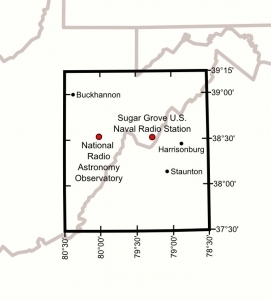 The National Radio Quiet Zone includes much of eastern West Virginia. The National Radio Quiet Zone is an area of nearly 13,000 square miles located in the mountainous eastern United States in which radio transmissions are restricted to aide scientific research and military intelligence facilities. The zone is an approximate rectangle that straddles the borders of Virginia and West Virginia and includes a small corner of Maryland. It is centered in a sparsely inhabited region between the Green Bank Observatory, in Green Bank, West Virginia, and the former Sugar Grove Naval Station, at Sugar Grove, West Virginia. The Quiet Zone was created by the Federal Communications Commission in 1958 to protect the National Radio Astronomy Observatory at Green Bank from radio interference and protects antennas and receivers of the U.S. Navy’s Information Operations Command at Sugar Grove. Most broadcast transmitters near the center of the zone are required to operate at reduced power and employ highly directional antennas; this makes cable and satellite communications all but essential for television. Restrictions on transmissions are tightest within ten miles of Green Bank and Sugar Grove, where most omni-directional and high-power transmissions are prohibited. The most severe restrictions imposed on the public are in place within the 20 miles of Green Bank, where staff patrol the area for devices that emit high electromagnetic radiation. Wi-Fi routers, microwave ovens, and faulty electrical equipment may all cause interference, and patrols may request citizens discontinue their use. Though they possess no legal powers of enforcement, the Federal Communications Commission can impose a fine of $50 on violations, though will work with equipment owners to to reach equitable solutions. The use of cellular phones in the core of the radio quiet zone is also highly restricted, and some residents within site of the radio telescope receivers at Green Bank can not use Wi-Fi devices, and microwave ovens are prohibited in all Green Bank Radio Astronomy housing units. Limited directional cellphone-service areas are in use in some isolated areas near Green Bank such as at Marlinton, West Virginia, and at Snowshoe Mountain Resort. Some radio transmissions are permitted in the core: emergency service and Citizen’s Band radios may be operated freely though the administrators of large transmitters typically coordinate operations with the observatory. The only broadcast radio stations that exist near the core are part of the Allegheny Mountain Radio Network, which maintains an AM station and several low-power FM stations. Exceptions are usually determined on a case-by-case basis, and allowances are made for public safety. Remote alarm systems, repeaters for emergency services, and National Oceanic and Atmospheric Administration Weather Radio are permitted. The Green Bank Interference Protection Group at Green Bank maintains policies to manage radio frequency interference by dividing the region into five zones. Zones 1 and 2 are located on the property of the Green Bank observatory, all of which is designated as Zone 1 except where housing, visitor, and laboratory areas are located, in which case they are Zone 2. Zone 1, also called the “Radio Astronomy Instrument Zone,” restricts intentional radiators to those deemed essential, and unintentional radiators must operate within ITU-R RA.769 recommendations established for radio-astronomical measurements. Gasoline-powered motor vehicles are forbidden in the zone as spark-ignited engines generate radio interference. All vehicles and equipment within the zone must thus be diesel-powered. Zone 2, also called the “Observatory Building Zone,” permits intentional radiators licensed for use within the zone, though not other radiators — such as WiFi, cordless phones, and wireless equipment. Certain unintentional radiators may also be allowed. Zones 3 and 4 are governed by the state’s Radio Astronomy Zoning Act, set out in Chapter 37-A of the West Virginia Code. This strictly regulates radio transmitters within two and 10 miles of the observatory, respectively. Interference detected therein is identified and documented, and owners of the offending equipment may be visited to request cooperation in eliminating the interference. Enforcement in Zone 4 may be more lenient than the limit set in the Chapter 37-A. Zone 5 shadows the boundary of National Radio Quiet Zone, and enforcement therein are managed by the National Radio Quiet Zone Administrator at the Green Bank Observatory. The dimensions of the zone are nearly rectangular and run 107.0 miles (172.2 km) across the northern boundary, 109.6 miles (176.4 km) across the southern, and 120.9 miles (194.6 km) along the eastern and western boundaries. It includes all land with latitudes between 37° 30′ 0.4″ N and 39° 15′ 0.4″ N, and longitudes between 78° 29′ 59.0″ W and 80° 29′ 59.2″ W.
The area within and near the zone has attracted residents and visitors who believe they suffer from electromagnetic hypersensitivity. The National Radio Quiet Zone has also been mentioned as significant in the design of the Fallout 76 video game, which takes place in West Virginia.